Note: If you are looking for an overview on all museums that there are in Salzburg, please take a look at our Salzburg museum directory. 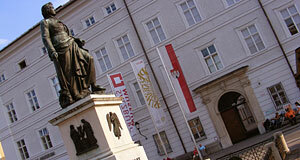 This article is about the official city and province museum of Salzburg. Promotional Video published by the Salzburg Museum via YouTube. In a way, the Salzburg Museum is a combination of a town museum and a museum of regional history and culture. Since 2005, the museum is situated in the Neue Residenz, a Baroque palace right at the spiritual (or touristy) heart of Salzburg: The Mozartplatz (Mozart Square). The museum is dedicated to art and history of the city and province of Salzburg; that being said, don′t expect a dusty and boring display of artefacts with tedious written descriptions. Just the opposite is the case: The Salzburg Museum is a lively, modern combination of multimedia information, artefacts and artwork that comes in modules of temporary and permanent exhibitions. We warmly recommend the Salzburg Museum to all visitors of our city that stay for longer than two days and want to learn more about the place than quick strolls through the city centre would allow. There are audio guides available in a range of languages and most written explanations come in both German and English. The Salzburg Museum extends over 3,000 square metres of exhibition space. It was awarded "European Museum of the Year" in 2009. A little fun factoid: The air conditioning of the museum is done with a cooling system that uses the cold water from a side-branch of the Almkanal, the ancient canal that runs underneath Salzburg. This side-branch was built in 1143. The origins of the museum itself are not quite that old: It can be tracked back to 1834, when a small collection of militaria and other local things was made accessible to the public, mainly to formalise the memories of the Napoleonic Wars. When the widow of Emperor Franz I. moved to Salzburg, she became the trustee of the collection. Following the revolution of 1848, the collection became the official town museum of Salzburg and was named "Museum Carolino-Augusteum" in honour of Empress Karoline Auguste. The museum was situated in a building in the Griesgasse (next to today′s Republic art venue) and short of space. In 1923, the natural history objects of the ever growing collection were given to the Haus der Natur. One year later, the folk culture collection opened a side-branch in the Monatsschlössl in the parks of Hellbrunn Palace. During WWII, the museum got three direct hits from bombs. Most of the collection had already been taken into mines that served as bunkers; however, the building was completely destroyed alongside with many very large objects that had been immobile. To make things worse, several objects disappeared from their bunkers during the time of US occupation - including a collection of gold coins that was kept in the salt mines of Hallein. A new building was opened as a provisory museum in 1967, sort of a twin to the Haus der Natur. A debate about a final and worthy headquarter of the Salzburg Museum started and lasted for decades. Side-branches of the Salzburg Museum were opened during this time: The Domgrabungsmuseum in 1974, the Spielzeugmuseum (Toy Museum) in 1978 and a newly developed Festungsmuseum (Fortress Museum) in 2000. By 1997, local politicians had finally agreed on assigning the Neue Residenz as a new venue for the Salzburg Museum. As mentioned above, the museum re-opened here in 2005, the old building of the Griesgasse was adapted and is now part of the Haus der Natur. The Sattler Panorama painting is in the new venue, but has a separate entrance. It can therefore be seen as a side-branch, just like the museum of ancient musical instruments, which is in the same building as the toy museum. There are combination tickets available for all branches of the Salzburg Museum as well as individual ones.